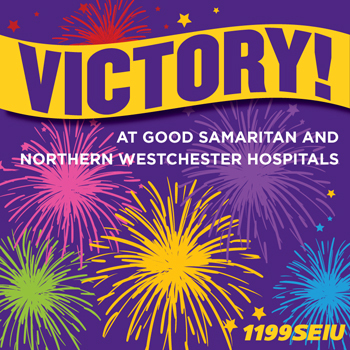 Today we welcome into the 1199SEIU family more than 300 new members at Good Samaritan and Northern Westchester Hospitals in New York's lower Hudson Valley. By providing compassionate and professional care to thousands of people in the lower Hudson Valley, our new Good Samaritan and Northern Westchester hospital union sisters and brothers embody the spirit of 1199SEIU members everywhere. 1199SEIU is the largest healthcare workers union in the US, with more than 420,000 members in five states along the Eastern seaboard. We are one of the fastest growing unions in the country. As well as having a larger say in their working lives, the workers at Good Samaritan and Northern Westchester Hospitals voted to become union members so that they could collectively bargain affordable quality health benefist, a guaranteed pension, job security, and training and education benefits.